When I first started blogging almost 2 years ago, I wrote about a child-like persistence. I now have a few more years of parenting under my belt, which basically means I still have a lot to learn. I have learned so many unique lessons from my three beautiful boys. Each of them has been an amazing blessing from God. The one thing each of them has taught me is persistence. If you are a parent, you are quite familiar with the daily fun of having a child. Some children may be more energetic and out-going than others, but most children like testing their limits. As adults, we start setting boundaries. Many of the boundaries we set are healthy. For example, we have to set financial boundaries, otherwise we would be bad stewards of our money. It is also important that we set healthy boundaries with our families, church, and work. When I reflect on my childhood, I don’t remember setting many boundaries. I recall doing things as a child that I would not give one thought to as an adult. Things such as making a homemade bike ramp about 5-6 feet tall and jumping a bike off of it. Okay, my brother and I was a little crazy for attempting this stunt. But we did it and managed to survive the “Dare-Devil” stunt jumps. We could have killed ourselves many of times, but we survived and I'm here to write about it. The interesting thing is, I now can see this same persistence in my boys. But I believe most kids have some of this in them. Setting boundaries can be a great thing, but it can also be a terrible thing. Please let me explain. Sometimes we use boundaries to make excuses for why we cannot move forward in life with our goals and dreams. Sometimes those things we think are healthy boundaries are only hindering limitations. Limitations hold us back. They keep us stuck. When we constantly place limitations on our lives, we then begin to feel that things will never change. Quite frankly, we begin giving up and quitting at life when we are calling these limitations healthy boundaries. This is one of the reasons why we must go beyond our limitations. Yes, I know it does not have the ring of the old adage, but it is so true. Don’t be this person. Go beyond your limitations! Learn more. Dream more. Achieve more. How do you go beyond your limits? 1. Children Are Always Learning. Children are always exploring because of their many curiosities. Don’t settle for living the way you are currently live. Explore various opportunities to grow your parenting skills, your job status, your leadership skills, your business, your financial freedom, your church, etc. Continue learning and you will find that you will continue to grow. 2. Children Aren’t Afraid To Show Emotion. Why do adults hold back their emotions? We try to call it being professional, but we end up tricking ourselves to be unemotional. Emotions can be productive or counter-productive. I’m not telling you to throw fits and fall in the floor when you don’t get your way, but I am suggesting for you to get excited when something excites you. If used the right way, emotions can inspire and motivate that “Go beyond” attitude. 3. Children Are Hopeful. One word that describes most children is hopeful. The odds could be completely against a child, but they we look you square in the eye and tell you that they still believe. Hope believes. If you are going to go beyond your limitations, you will need to believe. Believe in God. Believe in yourself. Believe in your team of supportive individuals. 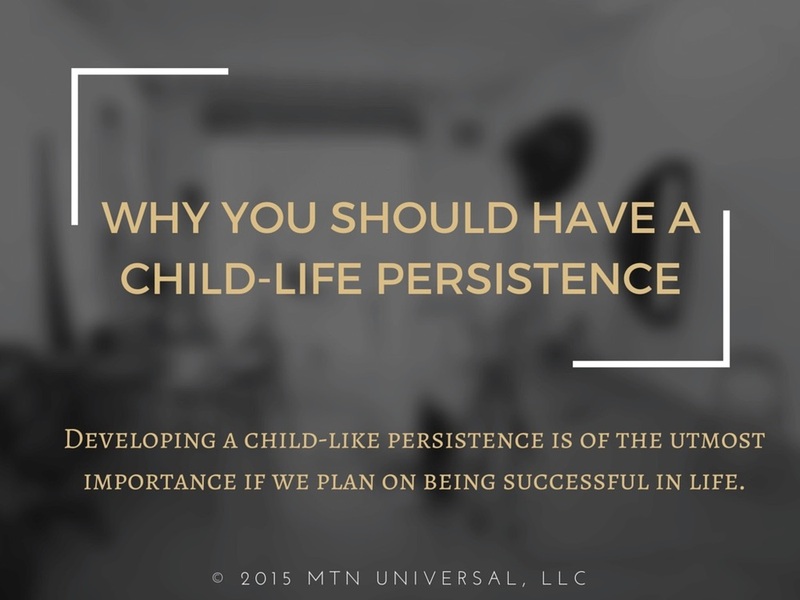 Developing a child-like persistence is of the utmost importance if we plan on being successful in life. Many times we quit too soon. We stop before we reach our blessing. Please do not make this mistake. You need a child-like persistence. Take calculated risk, but more than anything be persistent. Start today! Question: What things are you working in your life that requires you to have a child-like persistence? Leave your comments below.